Don Milne once again, as Roadtrip-'62 ™ continues west. Today, day twenty-eight, we will hit the halfway point of our US-6 journey. Yesterday, we traveled 137 miles from Lincoln to Hastings, Nebraska. We saw the Kool-Aid Museum and Quonset hut buildings that may have been left from the old Fairmont Army Airfield. Today we will see the remains of a different type of World War II facility, along with a religious shrine and more. If you see anything you like, get yourself out on the road and enjoy it in person. You might be having fun on this virtual roadtrip, I know I am, but there's nothing like the real thing! At any time, click on an underlined word below to learn more about the places on the trip. Let’s get back on the road again! I bought enough donuts yesterday, so let’s start the day with a picnic in a park here in Hastings, Nebraska. We could go back to Chautauqua Park, or Highland Park is a pleasant place to relax. Highland Park has several bronze sculptures and a small arboretum with trees, shrubs, flowers, and native grasses. Or maybe Lincoln Park, right at the junction of US-6 and US-281. It not only has picnic tables, but also grills in case you bought some smoky links at the supermarket this morning, like I did. 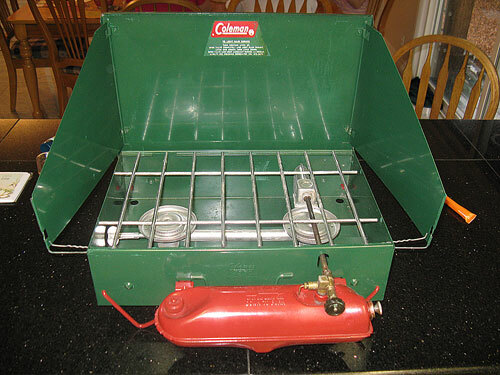 When I was younger, I traveled the Great Plains with a Coleman stove to make scrambled eggs in the morning, and I guess I should have brought it along again. No need to buy charcoal when you have a stove with you. Hitting the road again, US-6 BUSINESS rejoins us beyond the motels of Hastings and we are back in farm country. West of Hastings, all the way to the Colorado state line except through the small cities, the speed limit increases to 65mph, even though we’re not on a freeway. It’s fairly empty out here, so there is not much to watch for along the road. We quickly pass through Juniata and Heartwell, Nebraska without much to see, either in 1962 or today. Both sit a few blocks off of US-6. Heartwell is a town that burned almost completely back in 1913, with a series of three fires. Though it rebuilt somewhat, the high school closed in 1949, Heartwell State Bank voluntarily liquidated in 1955, and the town's only doctor died in 1963. Just about 30 minutes from Hastings, we arrive in Minden, Nebraska. Since we just spent several hours at the Hastings Museum yesterday, I’m going to skip the smaller Kearney County Historical Museum. But you may want to stop by. The Kearney County Historical Society was organized in 1925, so it’s safe to say we could have seen some display they sponsored back in 1962. This museum has four historical buildings: the Minden Schoolhouse, Kearney County Store and Post Office, the Keene Railroad Depot, and a Country Schoolhouse. These represent quite a good selection of Kearney County history, as they are Minden’s first school, the first post office in the county, and one of the first train depots in Kearney County. Harold Warp’s Pioneer Village 1974 brochure. Like most other things about the place, the brochure was probably not changed much from 1962. And here we are in Minden, Nebraska, home of the amazing Harold Warp’s Pioneer Village! There’s a billboard right at the city line to let us know the village is just ahead, and a covered wagon on the roof of the main building to let us know we have arrived. The last time I visited Minden, I stayed at a Friendship Inn in nearby Kearney, Nebraska. The Friendship Inn chain was founded in Salt Lake City, Utah in 1961. It was not the same type of motel chain that we see today, with common building designs, signing, and so forth. Instead, it was a common branding of existing mom-and-pop style motels. Choice Hotels International bought Friendship Inns during the early 1990s and merged them into their Rodeway and Econo Lodge brands, so they are gone today. Maybe it’s just as well I am not staying in Minden tonight, as the only motel I see here is the Pioneer Village Motel, which still looks about the same as it did in the 1950s. It probably was a much better choice in 1962. I guess maybe folks mostly still stay up in Kearney. Hard to say where to begin about Harold Warp’s Pioneer Village. It’s a museum, run by the non-profit Harold Warp Pioneer Village Foundation, but a bit different in style than what you may be used to. It began as a private museum and tourist attraction and has a very singular purpose: to showcase and inform people about the development of technology, especially in the United States, from the pioneer days of 1830 to about 1953, when the village opened. Pioneer Village opened to the public in June of 1953 and was fully stocked with historical artifacts and buildings bought by founder Harold Warp just for this use. The last time I visited, the village boasted over 30,000 artifacts, but now claims over 50,000 historical items, so the collection has grown. It is now the largest private collection of Americana anywhere. Nearly all items have been restored to working order. What impressed me the most was the chronological arrangement of each category. You can view typewriters in the order of development from the earliest to current office models, including many odd dead-end ideas along the way. It was the same with automobiles, washing machines, various farm machinery, lighting, guns, and much more. Pioneer Village has 26 buildings; most of them are themselves historical. Historical crafts such as broom making, blacksmithing and more are demonstrated. Most of the buildings are arranged around a village green. They include a Frontier Fort, a real Pony Express Station, a prairie sod home, a nicely stocked old general store, and the Warp family barn. There is also a rural school building that was moved here complete with its original desks, books, stove, water pail, dinner pails, and even its outhouse! The oldest steam-powered merry-go-round in the US is here, with rides only a nickel. There are three buildings displaying cars. Besides a large collection of Buicks and Chevrolets, including the first Corvette, there are 100 other cars in their order of development. Even an early house trailer and motor home, along with motorcycles, bicycles, and snowmobiles, are on site. Since photography and tripods are allowed, you can take home photos of your favorite artifacts. To honor today’s inventors, Pioneer Village Days are held in June, showcasing inventors who gather to display their newest concepts. Even popular art is represented, with a large collection of John Rogers sculptures. Between 1860 and 1893 John Rogers sculpted approximately 85 different groups of statuary that were turned into mass market plaster art by the 25 workman in his New York factory. These statues were moderately priced for the time, averaging $14 each, and were sold by the thousands. John Rogers’ sculptures became a nationwide fad, and it may be hard to imagine now, but his statuary was sold in virtually every art and bookstore in the country. The appearance of a new piece was a major event covered by reporters from newspapers around the country! The sculptures were often groupings of people and remind me of the later Norman Rockwell paintings we could see in the Saturday Evening Post in 1962. You may be wondering who Harold Warp was and how he acquired the money needed to buy the historical artifacts and build the Pioneer Village from scratch. Harold Warp was an early entrepreneur in plastics, beginning in 1924 at the age of just 20. He moved from Minden to Chicago and began manufacturing Flex-O-Glass, a window material he had originally developed for his family's chicken coops. The product was very successful and his company expanded to other plastics. He returned to Minden around 1950 and began buying the buildings that would make up Pioneer Village. His company, today called Warp Brothers Plastics, is still in business, making a wide variety of plastics including extruded polyethylene plastic sheeting, acrylic safety glazing, storm window materials, drop cloths, lawn & garden plastic products, trash can liners, oversized storage bags, ribbed floor runners, and ribbed shelf liner. When I visited Pioneer Village, I remember reading displays about his storm window kits, which were plastic sheeting that you stapled over your house windows during the winter to keep wind and cold out. We used this at my parents’ house during the 1960s. Minden is also known as “The Christmas City”, but we won’t be able to see why at this time of year. They have decorated the town square with colored lights since 1915, a very early use of electric lights for Christmas. Originally intended to impress the state convention of the Grand Army Rerpublic, the City Light Commissioner strung lights from the railroad depot to the town square. At Christmas time, Commissioner J. C. Haws found a new place for the lights on the courthouse dome. Additionally, the city has hosted the “The Light of the World” pageant since 1946, which is held on the courthouse lawn. The performance culminates in the lighting of Christmas lights around the square. So this would have been a great place to come for Christmas in 1962. Recent light displays begin at Thanksgiving weekend and have grown to over 12,000 lights used to decorate the courthouse and other nearby buildings. I enjoyed Pioneer Village so much that I’ve spent the entire morning there, so now it’s time to hunt for lunch. Some people have mentioned spending an entire day, so consider yourself lucky that we’re getting back on the road. We could have lunch at the snack bar in the museum, but I’m not usually too fond of the easy prep burgers, corn dogs, ice cream and related fare. Driving around town, I don’t spot much in the way of older restaurants. The Southfork Drive-In’s sign looks 1960s or older, but the building and parking lot look 1980s or newer. And I can’t tell anything about the Red River Steakhouse and Lounge, as it’s in a plain brick building downtown that doesn’t even have windows. I’ve read that their homemade onion rings are incredible though. Well, maybe this is a good day to have a picnic at nearby Chautauqua Park. The park is just a couple blocks north of the downtown square and has plenty of picnic tables. After lunch, you can enjoy the small rose garden and there is a playground for the kids. We can buy some picnic food just a block south of Pioneer Village at Mason’s Supermarket, or a couple blocks farther south at 5th Street IGA. I’m not sure if either was here in 1962, but I’m sure some supermarket was; maybe one of these under a different name. After lunch, heading west along the highway, you may see farmers harvesting hay on the shoulders! Where most eastern states spend a lot of money cutting grass, Nebraska and some other Great Plains states sell hay. 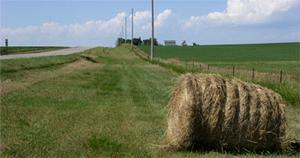 Farmers can obtain a permit to harvest up to 5 miles of shoulder annually, so don’t be surprised to see bales of hay sitting along US-6. There is not much to the small settlements of Axtell and Funk, Nebraska. But just a couple of miles north of US-6 lies the Funk Waterfowl Production Area’s Observation Blind. This area of Nebraska is a great place to watch the annual spring and autumn migrations of over 250 species of waterfowl. 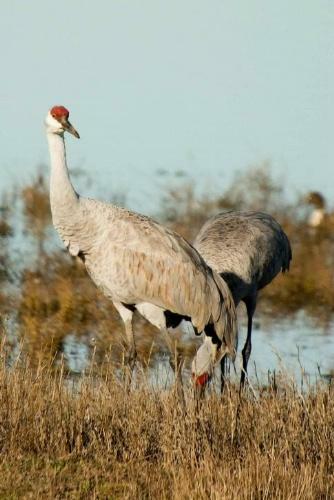 Every spring, more than 80 percent of the world's population of Sandhill Cranes stop over here in the nearby Platte River Valley! And even in the summer you can see some species such as cattle egrets, black-crowned night herons, great blue herons, and great egrets, which live in some of the permanent marshes year round. The most unexpected birds for me were pelicans! I didn’t think you could see them anywhere but at the ocean, but they fly through Nebraska on their way from one ocean to the other. There is a three-mile loop trail on the dikes around Funk Lagoon, which is great for viewing the birds. Back in 1962, you would not have had such good viewing opportunities, as the U.S. Fish and Wildlife Service only began acquiring critical migratory waterfowl habitat here in 1963. This geographic area is known as the Rainwater Basin and is a complex of wetlands in shallow basins scattered throughout a 21-county area. Historically, bison and wildfire kept these wetlands open during the dry summer months and droughts. With the bison herds gone and wildfires controlled, the Fish and Wildlife Service has to do a lot of work to keep these wetlands available for water birds. Holdrege, Nebraska is home to the Nebraska Prairie Museum, operated by the Phelps County Historical Society, which formed in 1966. That makes it too new for us to view their collection of artifacts and memorabilia of Phelps County. But it is an interesting collection, with the outside grounds containing a schoolhouse, church, windmill, and farm home moved from Phelps County locations. You can also see a railroad caboose and a reproduction of a guard tower from the former World War II German prisoner of war camp that was near Atlanta, Nebraska: more about the camp later. There is also an exhibit room of memorabilia from the camp along with collections of period clothing, antique toys, farm equipment, and household items. While driving through Holdrege, we cross highway US-183. This highway runs from Refugio, Texas to Presho, South Dakota, passing through prairie farm country for nearly its entire distance. An indication of just how rural this area is that a 40-mile segment of US-183 north of here was still not paved in 1962. In fact, the US-183 was the last US-numbered route to be completely paved, in 1967, when another piece in northern Nebraska was finally hard surfaced. Holdrege and the surrounding area can be successfully farmed today largely due to irrigation. As early as 1910, it became evident that pumping subsurface water alone would not make successful farms here. C. W. McConaughy, a Holdrege grain dealer, began a quest to use Platte River waters for irrigation, which led to the Central Nebraska Public Power and Irrigation District beginning electric power production and irrigation in 1941. A large increase in the population of Holdrege in the next decade was due mostly to irrigation leading to both a stable and increased crop production, which brought more agriculture-related businesses to town. The project provides irrigation water to about 112,000 acres of farmland. Fittingly, the first thing we see coming in to town from the east is the agriculture related grain elevators. In front of them is the Cozy Inn Café. One source mentioned a motel across the road, but that’s now a vacant lot. The next landmark is the Hotel Dale, a solid looking six-story brick building right on US-6 in the heart of downtown. It was opened in 1931 as a 73 room hotel and is a concrete and brick building. In the early 1960s, a two-story brick addition was made on the east side for a new restaurant. Strangely, it included a three-bedroom apartment on the second floor for the owner. I could not discover if this was before or after 1962. It was once the place to stay in Holdrege, with The Three Stooges, Ernie Stubbs, and Gene Autry stopping in over the years. In 1980, the hotel rooms were been converted to apartments by merging small rooms into larger spaces. The building is still operated as apartments, known as The Dale Loft Apartments. The old restaurant sign still hangs outside, but the restaurant inside is the newly opened El Agave. There is also the Dale Hotel Barber Shop, occupying a space that was known as Smitty’s Barber Shop in 1962, and a couple of other businesses in the building. This might be time to stop for a haircut! Another business we could have stopped at in 1962 that is still open today is Holdrege Floral. It has been in business at its current site since 1907. The well-maintained brick streets around the courthouse give the whole town a stable feeling, though some older businesses are gone. The Tower Motel and Lounge used to be a beacon to roadtrippers on US-6, with its white tower topped by a winged wheel. Later in its life it became a Friendship Inn but it’s now a vacant lot. Just west of downtown, there is a good looking, former Conoco gas station. It’s now closed and the pumps have been removed, so no gas for us there. But the interior of the office area is furnished with old signs and other Conoco items as if a collector might own it. As we leave Holdrege, we pass a Dairy Queen and the Plains Motel out near US-183, but they may date from the 1970s. I mentioned before that there was once a prisoner of war camp for German and Italian prisoners in Atlanta, Nebraska, during World War II. Construction began in September 1943 and the camp operated until 1946, when the prisoners were shipped back home. All buildings have been removed, leaving only concrete slabs that were once building floors, and a chimney and silo-shaped concrete water tower as familiar landmarks of Phelps County. That is all we would have seen in 1962 also. While active, the prisoners were hired out to local farms to help harvest the increased crop production demanded by the war. Over 30 local farmers are known to have used the help, paying the government for the work of the POWs. The prisoners were then paid in scrip that was valid only for certain items at the camp store. Apparently some prisoners thought Atlanta was a good place to live, as after the war was over at least two of the Germans applied for US citizenship and returned. Besides this larger camp, there were smaller satellite POW camps at other places in Nebraska, like Indianola up the road. If we were visiting Atlanta in 1962, we would definitely stop at The Wigwam, which was known as "Nebraska's most complete Souvenir Shop." That was in the days before interstate highways had siphoned most of the tourists off US-6, and The Wigwam began its decline. Sometime before 2000, it had been converted to a restaurant and bar called the Husker Hut by adding another building. Thus it lost most of its kitschy charm. It now mostly abandoned, with old lawn mowers and junk piled near the front door. Alas, that means we can’t buy cheap, silly tourist junk today: no toy tom-toms, salt shakers or window stickers with “Nebraska” on them, or postcards with a giant ear of corn. In 1962, The Wigwam would have provided a bit of fun to relieve the boredom of the scenery. Today’s landscape has featured very flat land so far, but west of town it begins to change to rolling land with some eroded gullies. The land use doesn’t change much though: we still see crops, cattle, irrigation systems, and endless sky. We pass through Edison, Nebraska and the Edison Co-op Elevator, which was established in 1955. We reach Arapahoe, Nebraska next, passing the Shady Rest Motel at the east edge of town. It has a very nice exterior and an old sign with chase bulbs that looks like the name may have been changed. Just down the road is the Arapahoe Motel with its small, older cottages. It looks like it fits well with the nearby hunting areas, which give you a choice of hunting for upland game in rolling grasslands, grainfields, or hay meadows, or hunting in the deep canyons and bottomlands of the Republican River and its tributaries. US-6 does not run through downtown Arapahoe, but a quick trip several blocks south on US-283 brings us there. Highway US-283 runs for 731 miles from Brady, Texas to Lexington, Nebraska, just 37 miles north of us. Downtown shows quite a few old brick buildings that have been repainted or had modern fronts overlaid, along with several vacant spaces where more buildings probably used to be. The former Finch's Store building now houses the Furnas/Gosper County Museum, which was established in 1968. The mission is to preserve the history and artifacts of Furnas and Gosper Counties. One business still here is the Arapahoe Pharmacy. It’s been here and family owned for over 70 years and continues to serve Arapahoe from one of the few functional soda fountains in Nebraska. Of course, I’m stopping for an ice cream or something else from the fountain. The menu includes ice cream, sodas, sundaes, and phosphates, including Green Rivers. They actually make their own vanilla syrup in large kettles in the back room from a recipe that pharmacist Floyd Morris developed in the 1950s! The fountain also features old-fashioned glassware, original tin ceilings and wood floors to help transport us back to 1962…or earlier. After the ice cream, let’s stop at Our Lady of Fatima Shrine. The shrine is located outdoors, just west of St. Germanus Catholic Church at the west side of town on US-6. The shrine was built by Father Henry Denis and other dedicated parish members and was inspired by an event experienced by Father Denis during World War II. The Polish-born Father Denis was imprisoned in various prisons and concentration camps, including Dachau, from 1942-1945. One day he was praying the Rosary mentally during a roll call that resulted in the death of those called, but he did not step forward because of his prayer. Deciding that praying the Rosary had saved his life, he made a vow that, "If I ever leave the camp alive, I will express my gratitude by building for the Blessed Mother a little shrine." He was eventually freed and immigrated to America, where he was assigned to St. Germanus Parish in Arapahoe in 1949 and fulfilled his vow in 1956. Also on the church grounds is the statue of "Rachel Weeping for her Children." 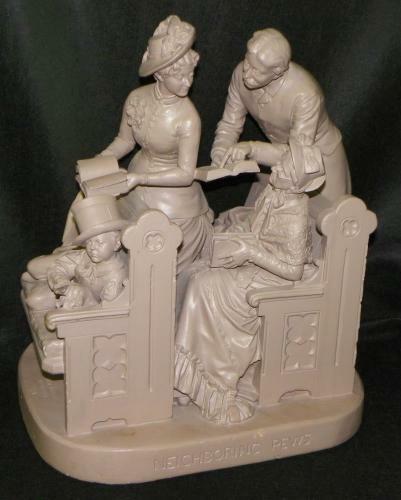 The local Knights of Columbus commissioned Cambridge, Nebraska artist Sondra L. Jonson to create an original sculpture of Rachel to show their commitment to the respect of life and preservation of the family. Jonson designed a bronze statue of Israel's matriarch Rachel kneeling in prayer and cradling an empty blanket, to reflect a society bereaved of its children but looking to God for healing and redemption. Interesting that we have found a Catholic shrine on both US-6 and US-23, where we visited the National Shrine of Our Lady of Consolation in Carey, Ohio. On our way out of town we pass the Westside Apartments, which looks like it was formerly another old, tourist cottage-style motel. In some ways, little has changed out on the Nebraska prairie since 1962. Our route on US-6 is still just a two-lane road and the area is still small towns and farm fields. But many of the towns have actually become smaller over the years. Furnas County, where Holbrook, Nebraska is located, had a population of 7,711 in the 1960 Census and had only 4,959 people in the 2010 Census. That partly empty downtown we just saw in Arapahoe was evidence of this trend. Downtown Holbrook is even emptier and the traffic on US-6 has changed very little in over 50 years. For example, the section between Arapahoe and Holbrook had about 1950 vehicles per day in 1962 and has about 2450 in 2012. The traffic on US-6 will be less than half of that by the time we reach Colorado, as the land becomes drier and the farms become larger to compensate for lower yields. From Holbrook to Culbertson, the bluffs along the Republican River are not high, but they do present some pleasing scenery for a change. They are on the right side of the road, with the river on the left as we travel west. The railroad is also back on our left side, having played hide and seek with us all day: it will continue to do so the rest of the day. If you drive US-6 on a slightly different schedule than I am, and you travel in an RV, Cambridge Nebraska, has a nice municipally-operated RV park right on US-6. It’s located on the banks of Medicine Creek and has all the modern amenities. The Bunkhouse Motel, a six room nostalgic roadside motel, is nearby for those of you who do not bring your own mobile home. The Butler Memorial Library, started in 1938, has a museum next door with a large collection of Great Plains relics, birds, prehistoric fossils, Indian artifacts, and local historical items. Something I’ve noticed here and along the way is that many auto dealerships have their cars stored under roofs. They look like storage buildings without sides, and I’m wondering if this is for protection from hail. Are hailstorms that common around here that new cars need protection? Down the road, Bartley, Nebraska was the site of an oil discovery in 1960-1961. The new money brought a lot of changes and we would likely have seen some new construction here in 1962. The oil industry still provides the area’s main non-agricultural source of income. It probably helps keep the State Bank of Bartley going, which has been here since 1897. Nearby Indianola, Nebraska used to have a welcome sign for us, touting itself as “The Best Little City Out West.” But that sign is now hanging in Trappers Bar (previously known as Indianola Cafe) and has been replaced by a modern sign on the highway. The city’s recently formed Indianola Historical Society notes that Indianola was the site of another World War II Prisoner of War Camp, one mile north of town. It housed nearly 2,000 German prisoners and after the war the camp was used by the US Department of the Interior, Bureau of Reclamation until 1954. Like the camp back in Atlanta, the buildings were demolished, the land was sold, and all that remains are two brick chimneys, a water tower converted into a silo, and the building foundations. If you have a mind to start your own Pioneer Village with some Nebraska antiques, you could shop at DaisyToad's Vintage. Or maybe you can find something from 1962! It’s not time for dinner yet, but there is an older place in Indianola that would be worth a try if it were. The Rocket Inn has been in continuous operation for over 70 years with only four owners. Its main attraction is the pizza, made from the recipe of Italian war bride, Fiorella Blume, who brought it here in the late 1940s. A secret ingredient infused into the crust is rumored to create the special flavor that keeps a farming community of only 700 people buying 500 pizzas a week. The Rocket Inn still has some of a 1950s look too, with Formica tables, metal chairs, and a coin-op pool table in the bar. The walls are hung with a collection of vintage signs, calendars and pictures, including a big 1950s-style illustration of a pizza man painted on the wall. Even the outside is retro, with a weather vane in the shape of a rocket on the roof. Just before we get to McCook, Nebraska, there is an old segment of US-6 that provides access to a Nebraska Highway Department facility and is used for practice centerline painting, through an old road cut. While the cut is scenic, so is the adjacent Harry Strunk Memorial Rest Area, which has a great overlook on the Republican River Valley. It’s a pleasant spot to contemplate our roadtrip, as this is about our halfway point. Of the 3652 miles from Provincetown, Massachusetts to Long Beach, California along US-6, we have covered about 1825 miles. At McCook, we cross another US-numbered route, US-83. It’s the fifth longest north-south route, running from the Canada–United States border near Westhope, North Dakota, to Brownsville, Texas at the Mexico-United States border. Despite its length, it seldom runs with any Interstate freeways, and those segments are short. It is also unusual because US-83 retains substantially its original length, as no part has been decommissioned as a route. Because of this, some have called US-83 “The Last American Highway.” The Highway 83 Association was established to promote travel on the route, and included Canadian members as far north as Swan River, Manitoba because Manitoba-83 continued from where US-83 ended. Perhaps travel on the route never amounted to much, as the society does not seem to exist anymore. There are no big metropolises along the highway, earning another nickname, "The Road to Nowhere." Similarly to its sister route US-183 that we crossed earlier today, the last stretch was paved near Thedford, Nebraska, in 1959. Besides our halfway point, we cross another important dividing line near McCook. In 1962, the dividing line between Central and Mountain time zones was just west of town, so we will turn our watch back an hour soon. That gives us an extra hour to head west today and perhaps still find something open. The line has since been moved west. If we were staying here, there are several motels and restaurants that might interest us. The Chief Motel and Chief Restaurant began as the Chief Motor Court in the 1920s or 1930s. Both are still open, though both look like much newer buildings, maybe built in the 1990s to replace the older buildings. Part of a previous building, maybe from the 1960s, is still in use. There is also the Cedar Inn at east edge of town, and the Economy Motel, which looks rather large for 1960s. But both have the typical single story row appearance of older motels. For food, there is Rehnert’s Dutch Oven Bakery, an old style downtown bakery, here since 1957. Besides the usual donuts, cookies, muffins and other baked goodies, the Dutch Oven has expanded to include a sandwich and soup lunch menu, and into making pizza crusts for others. 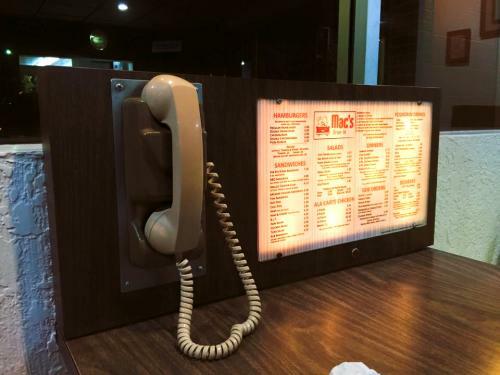 There is also Mac’s Drive-In, a restaurant with such 1960s touches as ordering from a phone at your table, either inside or outside. You get interior décor to match the period, or trays brought out to your car. Fuller’s Family Restaurant, a McCook fixture since 1946, has also reopened in a new location following a fire in 2013. While you may not yet see any of the 3,800 cookie jars the owner displayed at the old location, they have moved in some of the high-backed booths they were able to salvage. Right across the street from Rehnert’s Dutch Oven Bakery is the High Plains Museum. It’s a very new museum with very old things inside, so we will not be visiting. The museum features everything from authentic pioneer artifacts from the 1870s to a Railroad Room. The Political Room honors Senator George W. Norris and the three Nebraska Governors from McCook: Frank Morrison, Ralph Brooks and Ben Nelson. While we are still in town, I’m driving north a few blocks off US-6 to see the Sutton House. This is an unexpected find for a small Nebraska city: a house designed by architect Frank Lloyd Wright. He designed this in his famous prairie style early in his career, between 1905-1908. It is the only house commission he received as a result of two articles Wright had published in the Ladies' Home Journal in 1901. The house it is one of just a few homes he designed west of the Mississippi that is still standing and the only Frank Lloyd Wright structure in Nebraska. The Suttons made alterations while they lived in the house and in the next owner made further changes when he converted it into a medical clinic in 1960. The third owners restored some parts of Wright’s design after 1992 and the present owners have restored major portions, even while making additions to modernize the house. We can only view the exterior though, because it is still a private residence and not open to the public. Arriving in Culbertson, Nebraska, we are greeted by the unusual A-frame former lobby building of the Hilltop Motel. The motel has been converted to apartments, the sign is barely readable, and the lobby building has been converted to a storage garage. Three miles west of town, US-34 finally breaks off onto its own route into Colorado. It travels southerly and we travel northerly and meet again at Brush, Colorado. Our US-6 route follows Frenchman Creek as far as Palisade, Nebraska, with low, eroded bluffs and the railroad to our left and the creek to our right. The bluffs look more like rolling hills to me, and the land on that side is mostly cattle rangeland, not cropland like we’ve seen for days. The stream gullies cut into the sides are given the rather grand names of canyons. The town name of Palisade was a similarly grand name for these scenic bluffs. Palisade was the site of one of the prisoner of war camps that were branches of the main camp back at Indianola. As an example of the kind of farm work done by the prisoners during World War II, in one year they harvested 3,685 acres of sugar beets, enough to supply sugar to a city of one million population for one year! There is a historical marker about the prisoners in town. Palisade has the unusual distinction of having schools in both the Central and Mountain time zones. The kindergarten through fourth grade is in town in the Central Time Zone, with the rest of the grades in Wauneta, Nebraska, 15 miles west in Mountain time. Wauneta once had a small but beautiful falls on Frenchmen Creek, but they were destroyed by the Bureau of Reclamation in 1951 as a part of the flood control dam near Enders, Nebraska. We will leave town on an old alignment of US-6 that travels through some countryside that is known locally as the "Little Grand Canyon." After traveling through some of the “canyons”, the road ends up on high ground affording some spectacular Great Plains vistas. This was the US-6 alignment through about 1963, so we just make it. After that, the highway has been on the current alignment through Enders, but we come back to current US-6 a few miles north of Enders. The town itself is located at the foot of the dam of the Enders Reservoir, which stores water that irrigates around 21,100 acres of land. The Enders Reservoir State Recreation Area has become a popular location for fishing, hunting and other outdoor recreation activities. Camping is available with modern hookups, hunting is allowed for big game, waterfowl, and upland game, and fishing occurs in the 1,707-acre lake for many species including white bass, crappie, walleye, channel catfish, hybrid striped bass, largemouth bass, and more. We saw dry canyons along the old road, but it would have nice to see the lake, as it’s been many days since we’ve seen this much water! North of Enders, we begin to see windbreaks of pine trees planted along the highway, which help slow the winds so that soil is not blown away. Though new windbreaks continue to be planted today, these may be relicts from the Dust Bowl years of the 1930s, when the Shelterbelt Project planted trees in a 100-mile wide zone from Canada to Texas, to help protect the land from erosion. Farmers were paid to plant the trees, plow land into furrows, and to perform other conservation practices to reduce the dust storms. By 1938, the amount of soil blowing off the land had been reduced by 65%. The 1930s were the time of the worst drought on record, covering more than 75% of the United States affecting 27 states severely. By 1934, about 35 million acres of formerly cultivated land had been destroyed for crop production by the drought and winds, and another 100 million acres still in crops had lost all or most of their topsoil. Why did so much topsoil blow away? The combination of drought and poor land use practices created the environmental disaster. Between the 1860s and 1930s, most of the Great Plains had been farmed, as corn and wheat growing expanded west. While natural prairie grasses can survive a drought these farm crops could not and, when a several year long drought occurred, the crops shriveled and died exposing the bare earth to the winds. The worst devastation was in northern Texas, western Oklahoma and Kansas, and eastern New Mexico and Colorado. But Nebraska was also hit: the state normally averaged 20 inches of rainfall a year but only received 14.5 inches in 1934. 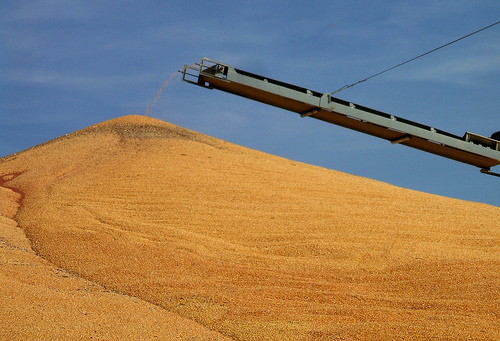 This reduced corn harvests from an average of 25 bushels per acre to only 6.2 bushels. Beginning the next year, the number of farms in Nebraska began a decline that continues today, as farms had to become larger to remain profitable. We reach the end of our day at Imperial, Nebraska. At the east edge of town sits a closed Alco Store. This is a chain of discount stores that went bankrupt in 2014 and all 198 stores closed in closed in March, 2015. The chain began as small five and dime stores, similar to S.S. Kresge and Woolworth’s. The first store was in Kansas, opened in 1901 and was named Duckwall’s, for its founder. Also similar to many other companies, it expanded into large discount stores in the 1960s, though not until rather late, in 1968. The Imperial location had been a Duckwall’s we could probably have visited in 1962, located downtown, until the Alco store was opened in 2006. Something that never seems to close on the plains is a grain elevator. While there have been grain elevators in every town we drove though the past few days, Imperial appears to have more than most. From some points on US-6 as we enter town near the east side, I could see three elevators at once. Sometimes, there still are not elevators in a town to store all the grain, as you might see a baseball diamond-sized pile of grain on the ground. The elevator is such an important fixture out here that in some towns, the buildings are almost in the road! Many downtown hotel buildings remain along US-6, but few are still used as hotels. The Imperial Hotel still has its great old neon sign, but is no longer a hotel. The Imperial Inn is open, however. It’s a modern motel that looks like it may have been a Super 8 or Comfort Inn. There is also one small, old style motel that still looks good on the outside, though it is showing its age. The Northside Motel advertises weekly rates, which I usually steer clear of, but then so does the newer Imperial Inn. I may just try the Northside because it fits our roadtrip better. The other choice in town is the Balcony House Bed & Breakfast. The Balcony opened in the 1920s as the Balcony House Hotel and Tourist Camp. The tourist camp didn’t last long, as it closed in the 1930s when the Great Depression reduced leisure travel. We likely would have found it to be apartments in 1962 and by the 1980s it was used as a boarding house, a dormitory for high school students whose families lived out in the country, and other apartments. It was eventually abandoned and purchased in 1997 by Jim and Linda Pirog, who began renovation. The new Balcony House Bed & Breakfast opened for business in 1999. Before dinner, I’m stopping at Hill’s Family Foods to see if I can buy some of that cracked wheat cereal from Wauneta Roller Mills. Hill’s is a locally owned store that has been serving the area for over fifty years: just our kind of place. A couple blocks away is Adams Drug Store, which also looks like it was here in 1962. But it appears that I’m not so lucky with finding restaurants here, as I’ve just discovered that there were a lot more dinner choices back in McCook. Perhaps Imperial is just too small to keep a place in business for over 50 years. There is a soft-serve ice cream place, Twist & Shake. Or maybe there was; the online info I got before arriving was not clear as to whether it had closed or not. Everything else is newer, but the Taco John’s chain dates back to 1968, so that’s close. I’ve been seeing these all day long. John Turner opened the first Taco John’s in Cheyenne, Wyoming and franchising began in 1969. Today, they are all over the western states. If you come in August, you can stay busy for the evening at the Chase County Fair and Expo. It’s one of the biggest county fairs in Nebraska and undoubtedly has roots before 1962. The fair features live music, agricultural exhibits, a classic car show, and of course rides on the midway. There are also over 100 vendors that exhibit their products each year in both indoor and outdoor spaces. I’ll probably just watch TV at the motel tonight: what to watch? My dad loved westerns, and I remember watching Wagon Train a lot, probably every Wednesday night for years. The show aired on NBC from 1957–1962 and then on ABC from 1962–1965. Shows moved between networks quite frequently back then. Apparently, a lot of other people were watching, because it peaked at #1 in the 1961–1962 television season. As was typical of the time, the show was broadcast in black-and-white, though 5 episodes were in color during 1962 to promote sales of RCA's color television sets, because the NBC network was owned by RCA. As the title implies, the series was about the travails of a pioneer wagon train across the prairies and mountains of the western United States. In particular, this convoy was traveling from Missouri to California. The series starred veteran movie actor Ward Bond as the wagon master when it began. After he died in 1960, he was replaced by John McIntire. Let’s watch John and his fellow actors, and maybe I’ll change channels and watch Top Cat cartoons afterwards. See you tomorrow on Roadtrip-’62 ™ ! Full episode of Wagon Train TV show, 1962.